Scarred for life after watching Mommy rogering Santa on Christmas Eve as a kid, down-trodden middle-aged loner Brandon Maggart is dismissed as a loser by everyone and treated like dirt in his day job at the “Jolly Dreams” toy factory. 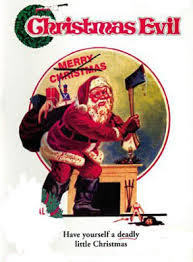 He nonetheless clings desperately to the true spirit of Christmas, striving to bring some goodwill to the grungy modern New York City, but his good intentions end up tipping him over the edge into a killing spree. Though sold as another holiday-season slasher flick, this surprisingly low key character piece opts for melancholia and witty black humour instead of gore (though someone does lose an eye via a toy soldier). Maggart, maniacally humming festive tunes and deluding himself into thinking his van is a sleigh, is outstanding as a well-meaning misfit who finds the cynical modern world not conducive to his old-fashioned concept of Christmas. The finale pays loving homage to the lynch-mobs of classic Universal horror, though the final scene unashamedly segues into unexpected whimsy to offer the kind-hearted, unlikely murderer a fantastical send-off. This long-underrated gem is full of clever comic touches, from the Christmas Eve news announcement to “avoid anyone dressed as Santa” to a police station line-up in which the collective Santas are instructed to step forward and say “Merry Christmas”.